Rick Goodman landed the largest chinook of the year. This beauty weighed in at an impressive 58 lbs. 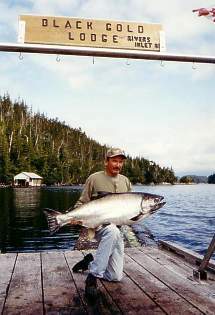 However, Rick or “Uncle Ricky” as he is known in our family, deferred his free trip to the person who landed the second largest chinook of the year. What a gracious gesture by one of Black Gold’s top rods!